In recent years an enormous amount of cosmological data has come from well known projects such as the Hubble Space Telescope (HST) and the Cosmic Background Explorer (COBE). This book explains and makes sense of this vast array of new observational data in terms of its impact on current cosmological models. 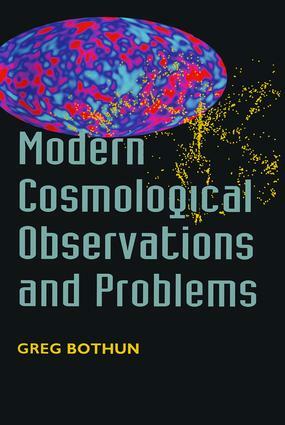 With new theories and a plethora of data feeding cosmology in the 1990s, Gregory Bothun sets about the task of re- assessing our cosmological models. He outlines exactly what the latest observations are, and how they should be seen as either consistent or in conflict with current cosmogenic scenarios. In this search for a reconciliation of current data with competing theory, he explains how Einstein's idea of a cosmological constant has now become a viable hypothesis. This authoritative text should be valuable to all those studying cosmological observations at advanced undergraduate or beginning graduate level. Bothun draws a path through cosmology by defining a trajectory that is based on the data. This should also provide a framework for professional cosmologists and related readers in physics as it presents a solid observational foundation which either supports or conflicts with present theory. The book is illustrated including many CCD images of galaxies. Given the rapidly changing nature of the field, this book is supported by a World Wide Web site of supplementary material that is designed to readily update the material in the book. 1. Cosmological Model Building 2. The Extragalactic Distance Scale 3. Structure of the Universe 4. Galaxies, Clusters, Superclusters, Walls and Voids 5. Dark Matter in the Universe 6. Structure Formation Scenarios and Observational Constraints 7. The Distribution of Baryons in the Universe 8. Concluding Remarks and Future Prospects.